Pharmaceutical products are sensitive goods having to conform to the highest quality standards. During production, quality and required standards are under constant control and of course, the supplier products must also meet these requirements. 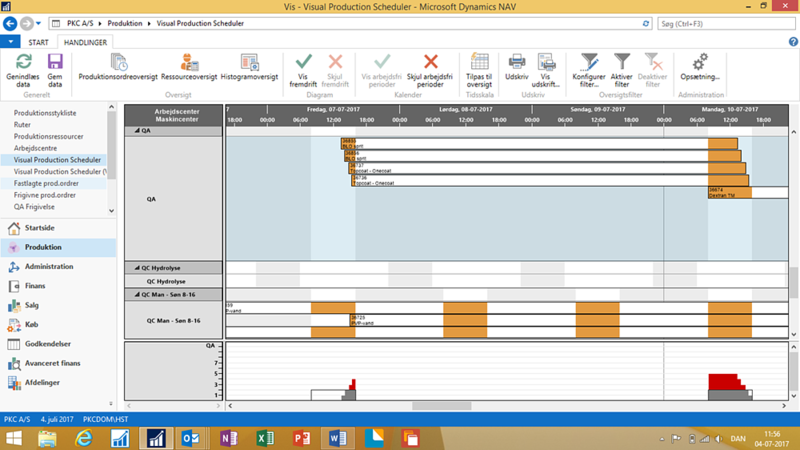 Read in this blogpost how by using the VPS, our Gantt add-in for production planning with Dynamics NAV, the Danish company pK Chemicals A/S, a global leader in producing Dextran, Dextran derivate, and Fine Chemicals for the pharmaceutical, medical, and cosmetic industry, improved delivery times with NAV by making production data more transparent thus gaining a better coordination process. To be accepted as supplier for the pharmaceutical, medical, and cosmetic industry, companies have to produce to GMP (Good Manufacturing Practice), a set of rules for quality assurance in this industry. pK Chemicals A/S applies two steps for controlling the adherence to standards. A laboratory testing the quality (QC = Quality Control) releases further processing. In addition, a final inspection (QA = Quality Assurance) at the end of the production makes sure that every product leaving the company corresponds to the defined quality standard. Naturally, these controls will increase the interdepartmental planning and coordination effort needed between production, laboratory, final inspection and sales. The staff members in the different departments have to know which product is to be produced for which customer, when it will be handed over to quality control and when final inspection releases the delivery. Only then can sales inform the customer about delivery. When the company established Microsoft Dynamics NAV, Henrik Størling wanted production data to become more transparent for gaining a better coordination process. He was looking for a way of visualizing the data of the pending orders and their processing steps in a large overview. He wanted every department to see when each individual product would be handed over to them for processing. 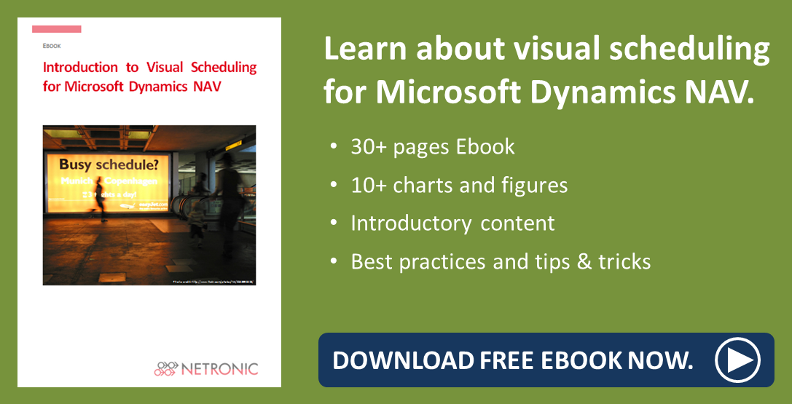 Since Microsoft Dynamics NAV doesn’t offer data visualization, Henrik came across NETRONIC‘s Gantt chart add-ins. 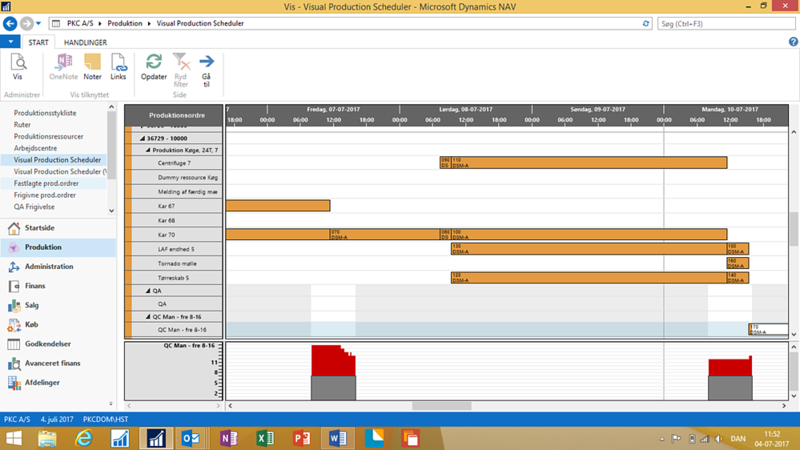 The Visual Production Scheduler easily made the wish for overview come true. In the picture below QA receives 4 orders for handling on Friday July 7th. On the planning board they can see that they have to finish their work on Monday 10th. pk Chemicals A/S does not only use the VPS for interaction between the departments Production, QC, QA and Sale, but also for production planning. Two criteria make the planning challenging: the production line comprises several machines, all depending on each other. Before a new production can start, all machines have to be cleaned. says Henrik. Here the main function of the VPS is to avoid double booking of machines. The picture below shows the production process of DSM-A on multiple machines. Red parts in the capacity curve below the Gantt chart indicate a resource overload at QC.